Lower Row, left to right: Ricky Kahn, Nick Depento, Gary Anslyn, Manuel Rangel, Sandy Aguirre, David Maldonado, Dean Nelson, Art Couvillon, Paul Curtis, Norma Wilson. 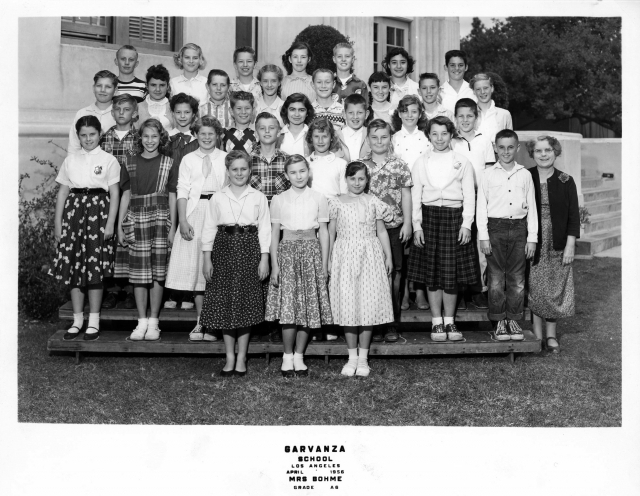 Second Row: left to right: Sandy Hoffman, Linda Ferandell, Raeanna Taylor, Gloria Ponteriero, Freida Kirkbride, Mercedes Roman, Rosemary Treadwell, Sue Lindelef, Nena Keer, Kaylene Garrett, Betty Jo Allison, Barbara Bishop.Third/Fourth Row, left to right: Jack Heller, Joni McDonald, Elaine O'Connell, Tom Thompson, Diane Chambers, Sam Chao, Judy Bannister, Chris Delgadillo, Ed Reyes , Sharon Howie, Bud Lewallen, Kathy Knowles, John Marshall, Sharon Guthrie, Ken Knowles, Renee Franklin, Diane Varela, Joe Van Meter, John Hess, Judy Eccles, Pat Wright, Michele Kammerer, Sandy Boos, Bill Rodgers, Joyce Hill, Beverly Sauer, Dee Macias, Sheila Anderson, Debby Lamb, Patricia Neri, Ray Sparkman. Back Row, left to right: Dennis Hubbard, Betty Findlay, Nora Burgess, Pat Taylor, Paul Harman, Ralph Sutliff, Sherry Hockman, Bob LaClair, Reiny Klein, Bud Kennedy, Mike Lepore, Bill Tennis, Manuel Ruiz, Fred Krog, Jim Miller, Fred Salinas, Bruce Bundick, Dave Lindsey, Lew Colgan, Joe Plescia. Click on photo to enlarge. Photo courtesy of John Hess. Click to enlarge. Photo courtesy of John Hess. Aldama Elementary School. Mr Scmmitt's A6 Class. June 1956. Bottom Row, left to right: Juliana Wingate, Judy Fowler, Sally Hutchcroft, Sherry Hockman, Anita Hill, Sharon Brockman, Cherly Matthews, Dolores Kaleel. Middle Row, left to right: Roy Vorhees, John Hess, Fred Staudhammer, Russell Poe, John Sullivan, Gary Mowen, Steve Bailey, Ernie Mash, Kim Marvel, George Fomenko. Top Row, left to right: Mary Baker, Renee Franklin, Pat Daubert, Christine Walker, Billie McGill, Vicky Carrillo, Francis Weisler, Sharon Guthrie. Annandale Elementary School. Mr. Shambra's 5th Grade Class. May 1955. Photo courtesy of Kathy (Johnson) Friend. Front Row, left to right: Lynn Maggie, Ray Williams, Kris Yanz, Alvin Powley, Vivian Newton, Wayne Schneider, Rosemary Treadwell. 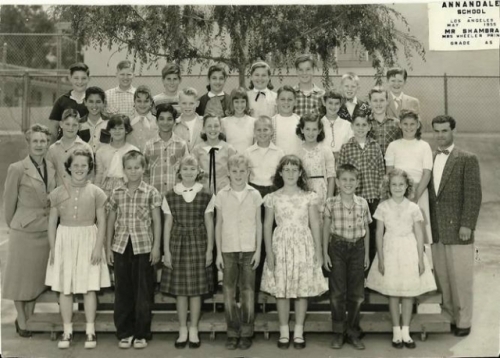 Second Row, Left to right: Casey Wright, Sharon, Richard Villalpando, Sandra Naftely, Bobby Dunnigan, Agnes Sanders, Stephen Palmer, Kathy Johnson. 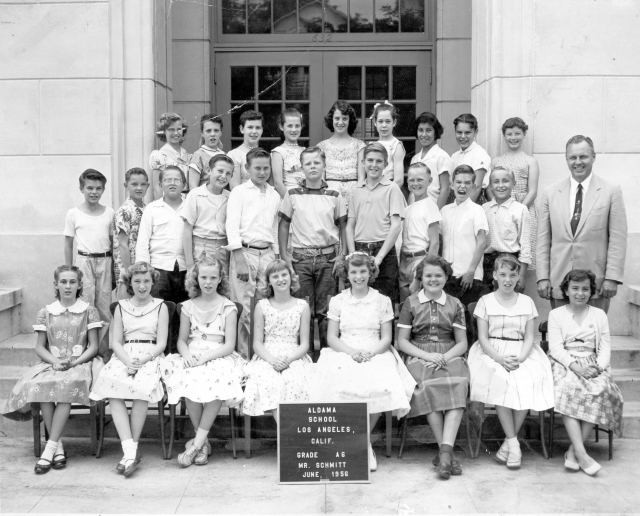 Third Row, left to right: Edward Colton, Joyce Hill, Dale Swanson, Jill Mika, Ronnie Schroeder, Sandy Boos, Glenn Malone. Top Row, left to right: Neil Carlisle, John Smith, Steven Widmer, Louise Tella, Elaine O'Connell, Charles Calyer, Leland Cypert, Paul Reese. Annandale Elementary School. Mr. Raikes' 6th Grade Class. April 1956. Photo courtesy of Elaine O'Connell. Front Row, left to right: Ralph, Joe Braden, Wayne Schneider, Ronnie Syfer, Bobby Dunnigan, Tom, Eddie Bayer, Stephen Palmer, Ray Williams, Agnes Garcia. Second Row, Left to right: Leland Cypert, Dale Swanson, Eddie Velasquez, Vivian Newton, Casey Wright, Richard Villalpando, jimmy, Albert Tingle. 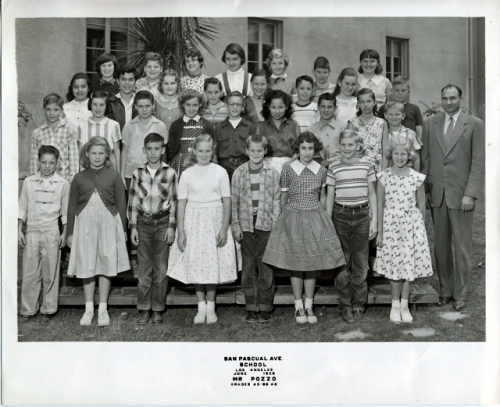 Third Row, left to right: Larry Cummins, Lynn Magie, Glen Malone, Agnes Sanders, Agnes Sanders, Ronnie Schroder, Sandra Naftely, Carlos Montez. Fourth Row, left to right: Nancy Bestle, Paul Reese, Marie Deskin, Eddy Colton, Kathy Johnson, Jason Teft, Jill Mika. Top Row, left to right: Neil Carlisle, Joyce Hill, John Smith, Elaine O'Connell, Mike Shirley, Louise Tella, Sandy Boos. Buchanan Street School. Mr. Handy's A6 Class. December 1955. Photo courtesy of Art Couvillon. Front row, left to right: Sarah Chi-chi, Sharon Cindrich, Wayne Anderson, Unknown girl, Ricky Berger, Judy Borgman, Billy Jacoby, Karen Marsh, Rosmary Baker. 2nd row, left to right: Mike, unknown, Larry Gilbertson, Betty White, John Duda, Carol Weaver, unknown, Art Couvillon. 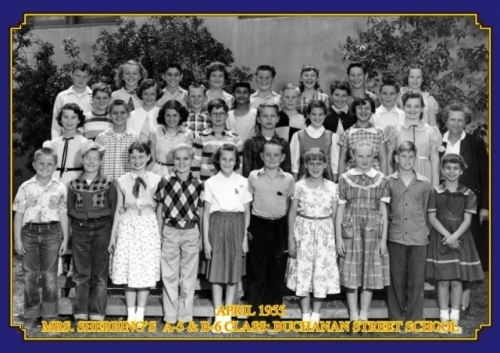 3rd row, left to right: Betty Ewing, Owen Otero, unknown, Vic Kostrukoff, Gloria Thomas, Dwayne, Barbara. Bushnell Way Elementary School. Mr. Rench's A6 Class. May 1956. Photo courtesy of Bud Lewallen. First Row: Mrs. Richard, Dorthy Houck, Judy Roberts, Joyce Bigelow, Gail Huggan, Jeanette Schock, Sylvia Smith, Linda Hall, Jean Passmore. 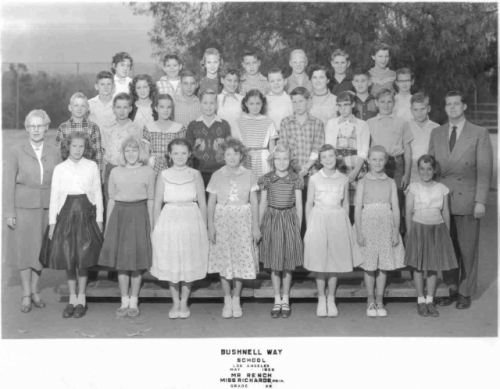 Second Row: Bill Coffey, Kenneth Wolfrank, Barbara Cox, Steven Johnson, Louise Rofidoux, Bud Lewallen, Karen Clark, Robert Webster, Duane Menkler. Third Row: Eddie Rives, Judy Moreno, Paul Sweet, Vickie Light, Richard Ballard, Joni McDonald, David Billures, Janet Teel. Fourth Row: Lynore Booth, James Delaney, Lynn Franzen, Bud Harper, Jean Boling, Richard Tefft, Paula Laball. Garvanza Elementary School. Mrs. Balm's B5 Class. December 1954. Photo courtesy of Sue (Lindelef) Di Julio. Bottom Row, left to right: Carolyn Leak, Kathy Hayes, John Hess, Yvonne Sylchak, Jim Bonnot, Unidentified, Richard Goecks, Raymond Goecks, Brenda Knibbs, Tommy Clark. Second Row, left to right: Maxine Lucero, Unidentified, Kenny Knowles, Unidentified, Unknown, Bob Burrell, Unidentified, Ronny King, Lauren Zuigin. 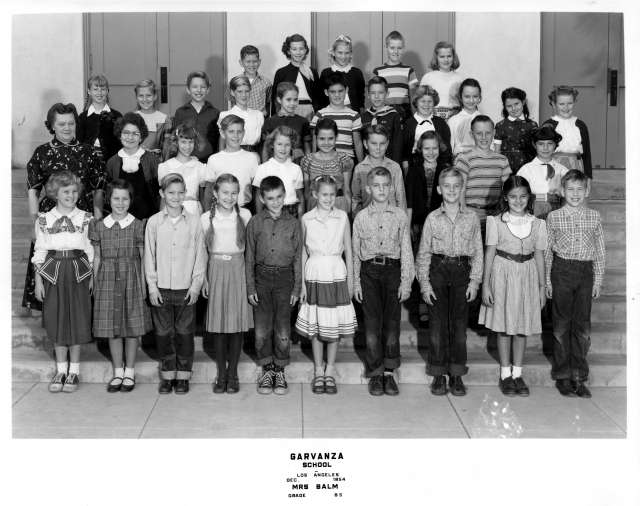 Third Row, left to right: Unidentified, Unidentified, Jimmy Smith, Tanya Countryman, Debby Lamb, Reiny Klein, Ralph Sutliff, Donna Keith, Unidentified, Unidentified, Unidentified. Top Row, left to right: Bill Tennis, Sue Lindelef, Jerri Kliewer, Richard De Long, Unidentified. Garvanza Elementary School. Mrs. Bohme's A6 Class. April 1956. Photo courtesy of Sue (Lindelef) Di Julio. Bottom Row, left to right: Carol Leak, Yvonne Sylchak, Kathy Hayes. Second Row, left to right: Unidentified, Unidentified, Donna Keith, R. Goecks, Bob Burrell, Cherly Hesser, Jimmy Bonnot. Third Row, left to right: R. Goecks, Bill Tennis, Maxine Lucero, Ralph Grambusch, Unidentified, Unidentified. Fourth Row, left to right: Unidentified, Unidentified, Kenny Knowles, Unidentified, Ralph Sutliff, Tanya Countryman, Top Row, left to right: Unidentified, Jeri Kliewer, Jimmy Smith, Unidentified, Unidentified, Unidentified, Unidentified, Reiny Klein. Latona Avenue Elementary School. Mrs. Bauer's A6 and B6 Classes. 1956. Front Row, left to right: Kathy Jones, George Parker, Harold, unidentified, Ernie Heridia, Elsie Sandoval, Lind Ferandell, Mildred. Second Row, left to right: bobby Schafer, Sharon O'Neil, John Scholl. 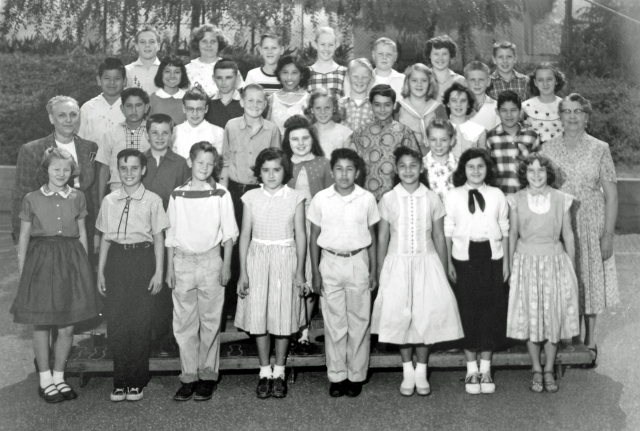 Third Row, left to right: Andy Cuellar, Jan, Royce, Sharon Johnson, Edward, Frieda Kirkbridge, Joey Navarro. 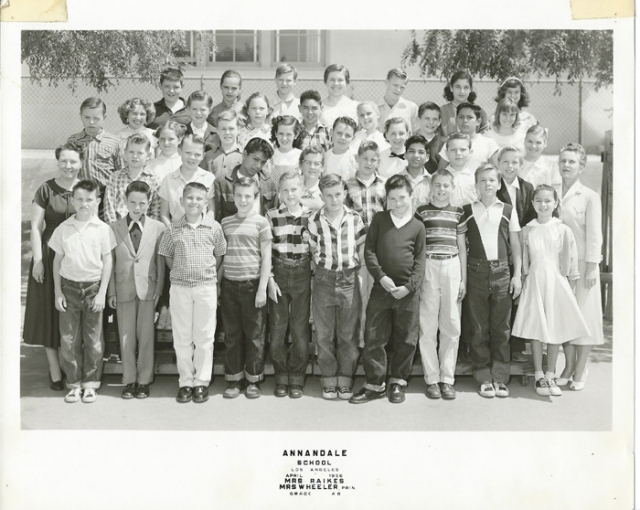 Fourth Row, left to right: Manuel Rangel, Eva Acevado, bobby Balderama, Carol Yorke, Wayne Langford, Marjorie Schwall, Jimmy Miller, Bernadette. Top Row, left to right: John Thomas, Martha Youngbird, Freddy Krog, Julie Funkhouser, unidentified, Diane Chambers, Glen D.
San Pascual Avenue Elementary School. Mr. Pozo's A5, B6, and A6 Classes. June 1956. 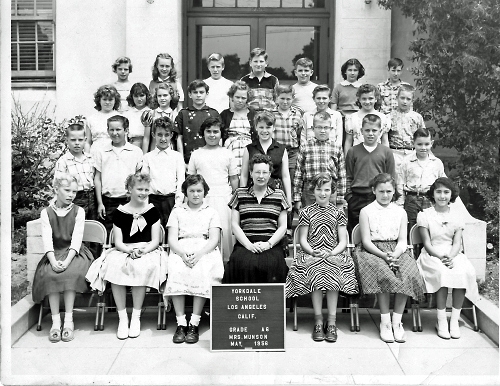 Front row left: Dean Nelson, Judy Dahl, unknown, Betty (Findlay) Pratt, Glen Irwin, unknown, Joe McLaughlin, Carolyn Potter. Second two left: unknown, Kathleen, unknown, unknown, unknown, Kathleen Woo, Joe Palermo, Diana Varela, Michael Barrett. Third row left: Virginia something, Robert Sanchez, unknown, unknown, unknown, Gary Morris, Diana Clark, unknown. Top row left: unknown, Billy Fisk, unknown, unknown, Margo Bazzani, unknown, unknown. Yorkdale Elementary. Mrs. Weihert's B5 and A5 Class. May 1955. Bottom Row, left to right: Dee Macias, Unidentified, Unidentified, Mike Kaemerer, Unidentified, Geraldine. Second Row, left to right: Unidentified, Andrea, Unidentified, Robert Lundgren, Teacher. 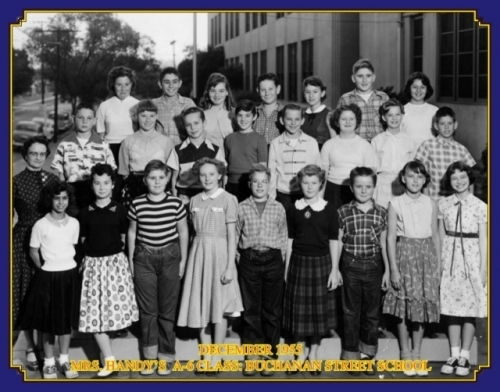 Third Row, Janice Hillman, Unidentified, Unidentified, Urban, Janet Langford, Unidentified, Sheila Anderson, Jim. Fourth Row, left to right: Alan Nesen, Amber McHugh, Unidentified, Unidentified, Carol Wingo, Unidentified, Unidentified. Top Row, left to right: Steve Lew, Judy O'Rear, Johnny Gardner, Unidentified, Paul Reese, Beverly Sauer, John Marshall, Klara Straudner. 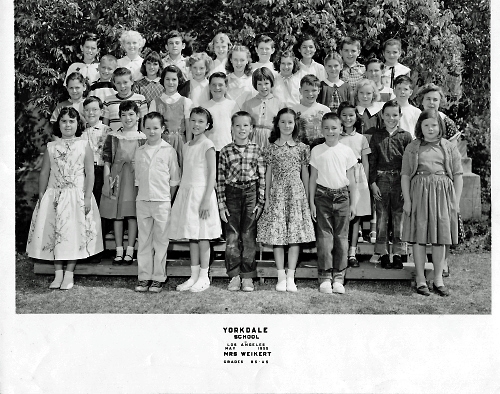 Yorkdale Elementary School. Mrs. Munson's A6 Class. May 1956. Bottom Row, left to right: Sheila Anderson, Marilyn Miller, Unidentified, Teacher, Judy Eccles, Janice Hillman, Unidentified. Second Row, left to right: Michael Kaemerer, Ray Sparkman, David Markowitz, Dee Macias, Janet Langford, Bruce Bundick, Steve Hartke, Robert Lundgren. Third Row, left to right: Unidentified, Amber McHugh, Unidentified, Johnny Gardner, Unidentified, Unidentified, Klara Straudner, Alan Nesen. Top Row; left to right: Beverly Sauer, Unidentified, Unidentified, Dennis Roe, John Marshall, Carol Wingo, Unidentified.